When travel agents recommend that holidaymakers take in the sights and sounds of New Zealand on foot, they probably don’t mean trekking 100km of stunning but gruelling terrain in just 36 hours. The 100km Oxfam Trailwalker event to be held at Lake Taupo in March is definitely no holiday. And members of the Canberra Crawlers, the local team travelling to New Zealand to participate in the event, do not expect the experience to be an easy one – even though they’ve done it several times before. Set up by the elite Queen’s Gurkha Signals Regiment in 1981 as a military exercise to test teamwork, endurance and determination, the Oxfam Trailwalker is described as the ultimate physical and mental challenge that raises funds to help fight poverty around the world. While there are a number of Trailwalker events across Australia and the world, the New Zealand event has a reputation for being one of the toughest. Fortunately for the Crawlers, the scenery is said to help ease the pain of blisters and lack of sleep. The Canberra Crawlers are Phil Jacobs (captain), Rod Vickers, Peter Bell and Skye Cappuccio. Between the four of them, they’ll have 19 Oxfam Trailwalker events under their belt at the conclusion of this year’s event. To meet the physical demands of the 100km trek, their training program involves at least one weekly 20km walk up and around Mount Majura and Mount Ainslie and back, with training to become more intensive as the event gets closer. “Firstly it is a way to raise funds to assist communities build infrastructure to support their families now and into the future, and secondly it is a life changing event that challenges you both physically and mentally. 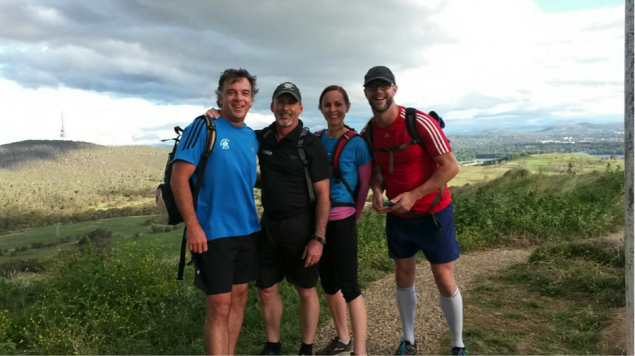 Give it go and you’ll see what I’m talking about – four people walking 100kms in under 36 hours,” he says. The team’s fundraising target is $3500. To help them reach their goal, visit their team page on the Oxfam Trailwalker New Zealand website, or support the team by heading down to FUNC Fitness’ fourth birthday party at Ronds Terrace on Saturday 14 February @ 9:30am, which is also raising funds for the team.